Fundraiser by Rachel Fleury : Dixie Needs Our Help! 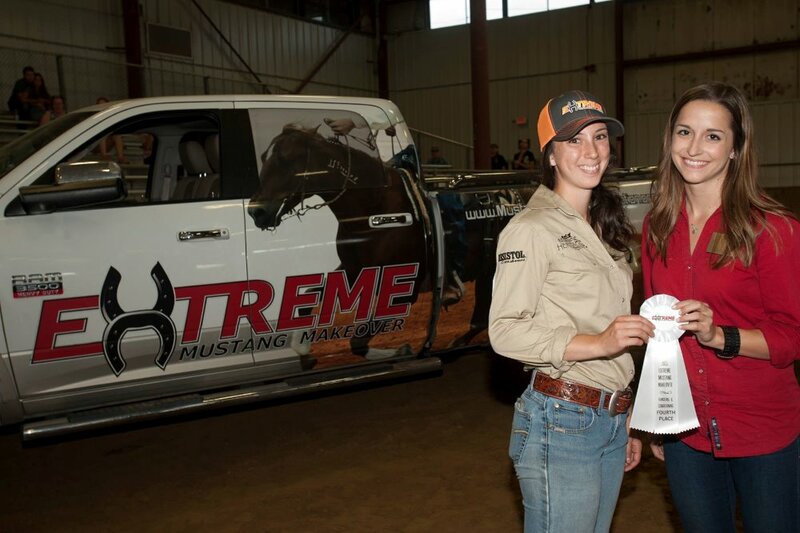 My name is Rachel Fleury and I am a competitor in the 2016 Extreme Mustang Makeover; a training competition in which you are assigned a wild mustang at random and given 100 days to gentle and train before partaking in a three class competition. Upon the completion of the competition all competing mustangs are auctioned off. Ideally I would like to be able to adopt her and see this situation through hopefully to a positive end. Dixie was loosely diagnosed with having an oral tumor which is about the size of a large egg. Unfortunately as with any type of medical expense it ends up being just that... expensive. I am trying to raise money to put towards Dixie's vet expenses. The first step will be to have the "tumor" xrayed followed by either a biopsy or biopsy and removal. The xray will determine whether or not it involves the bone. If it involves the bone the removal process will become much more complicated and costly. The reason this means so much to me is that besides all the effort, time, money, blood, sweat, and tears that have already gone into this, Dixie has stolen my heart. She gives 110% effort towards whatever we are doing. She is beautiful, sweet, smart, a little sassy, but most importantly she's my best friend. Dixie and I appreciate your time and ANY effort to assist us in our goals. You can follow our journey on Facebook! There hasn't been much to update until recently... Dixie's surgery is scheduled for the 29th of August with Dr.Limone and Dr.Barratt. What I was originally told was a Plasma Cell Granuloma (pathologists findings) is more then likely really an Ossifying Fibroma! The reason for the confusion!? This type of growth is fairly rare (especially the location of this one!) and from what I've gathered (hopefully I'm correct) there was a couple different cell types that were collected. The pathologists won't deem it an Ossifying Fibroma because they don't have enough to back that up (unfortunately we won't have enough until the entire mass is removed and then sent for testing!). Dr.Limone however did some research and footwork and has linked the characteristics of this growth with characteristics of none other than the Ossifying Fibroma. The characteristics which link Dixie's mass with classification of an Ossifying Fibroma are very distinct so it is fairly safe to say that is what it is. As I'm sure you have gathered from this post there are quite a few unknown variables that make this situation fairly complex. As with the diagnosis changing slightly so did the procedure and cost. They are predicting removing about 3 teeth (they will spare what they can) and a margin of bone around those teeth (again they will spare what they can) along with the mass of course. The goal here is to get a clean margin and make sure everything is removed so it doesn't reoccur. After the surgery Dixie is going to need at least one recheck and a thorough float every 6 months. Our quote started at a low 1-2K (before they knew all the details), to 3-4K (before they knew all the details), and is currently hanging at about 5K (they won't know all details until they are in there!). Needless to say the next week and a half is going to be a stressful and emotion filled time for Dixie and I. We honestly can't thank everyone enough who has supported us through this! It's not over yet but we wouldn't have made it this far without you all! 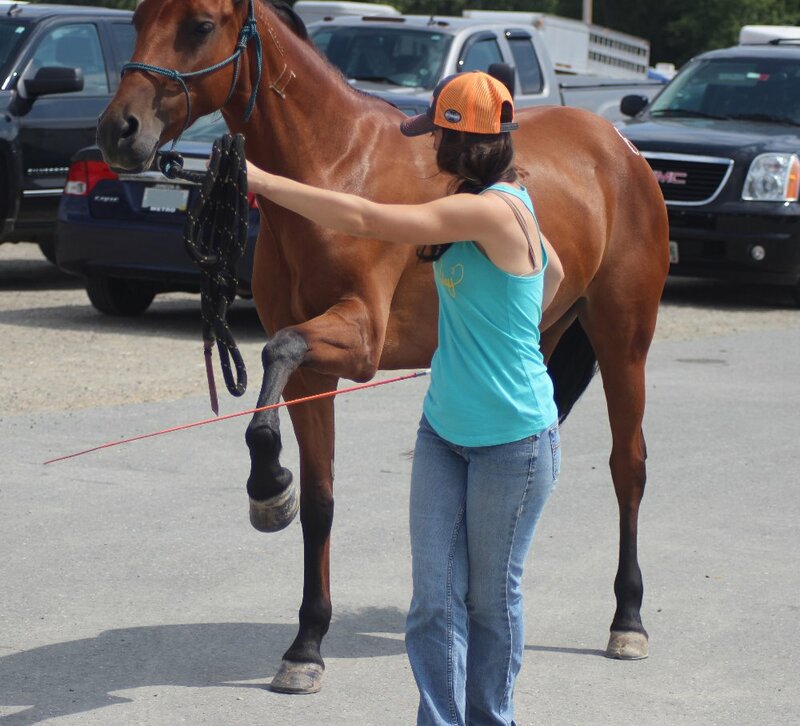 For that I thank you because I am at least able to give this beautiful smart mare a fighting chance! 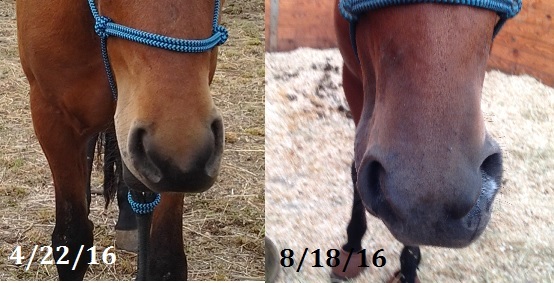 The vets are optimistic and I am trying to stay that way as well although its hard especially after putting together the side by side pictures of her mouth! We will more than likely be surpassing the money we raised so if everyone could give this one more big push before the surgery I would greatly appreciate it! was also able to speak with Mr.Hogan with the MHF and he was very open to trying to start a fund for horses like Dixie! So any extra money that is raised WILL go to help a mustang! Looking forward to pushing that campaign once Dixie is on the mend! Hey y'all! Sorry I've been so bad with social media! The competition was this past weekend so I was very preoccupied! Dixie was fantastic! We placed 4th in handling and conditioning, 17th in Trail, 15th in Manuevers, and 13th out of 25 overall! The auction went well and despite her tumor other people still bid on her! 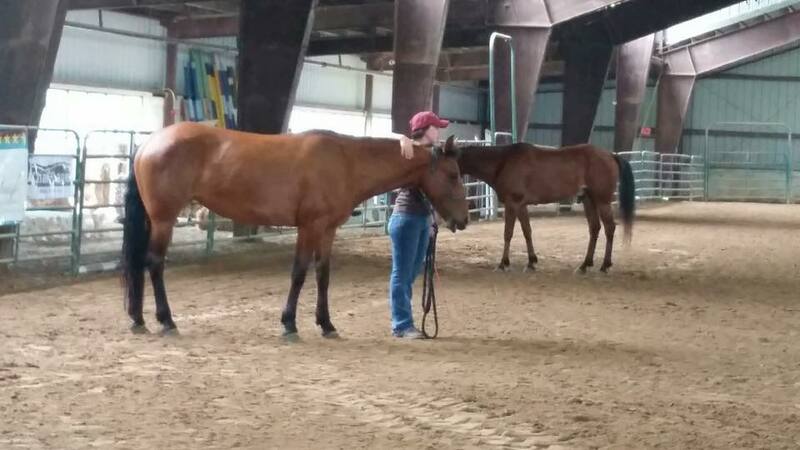 They backed off once they realized I was actively bidding on her so Dixie is officially MINE! Dr.Limone stopped by to talk this weekend (she will be doing the surgery). We have a tenative date set for the 29th of this month. They will be removing the mass along with some teeth. 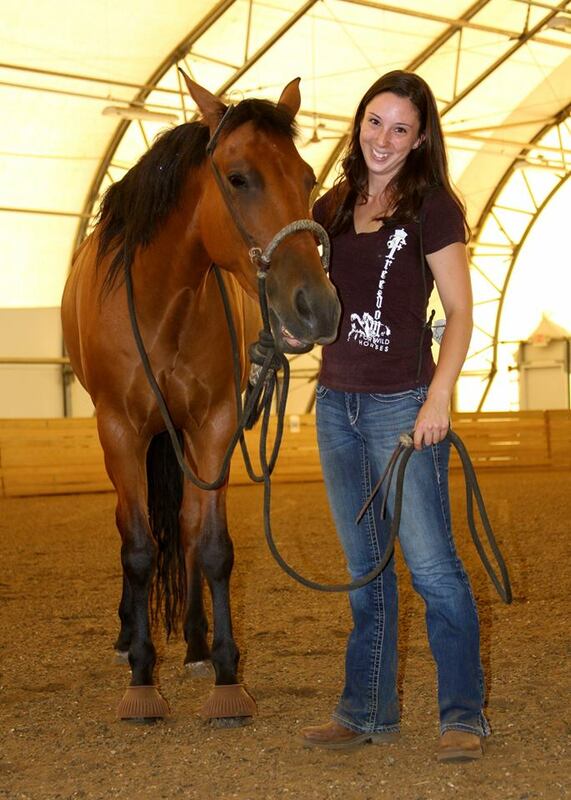 I was able to discuss starting a fund for other mustangs like Dixie and trainers like myself. They were very receptive to it so I will be working with the MHF to try and get that off the ground! I am leaving my gofund me open for donations for what will be "The Dixie Fund". Please share and help a bigger cause! IN THE SINCEREST WAY POSSIBLE I WOULD LIKE TO THANK EVERYONE FOR THEIR SUPPORT! IT WAS CERTAINLY A CHALLENGING JOURNEY AND WILL CONTINUE TO BE AS WE EMBARK ON THE NEXT CHAPTER. I WILL KEEP YOU ALL UPDATED AS WE APPROACH THE SURGERY! Hope you are all happy, healthy, and horse crazy! Hope you all are doing well! I apologize for not updating as often as I should! 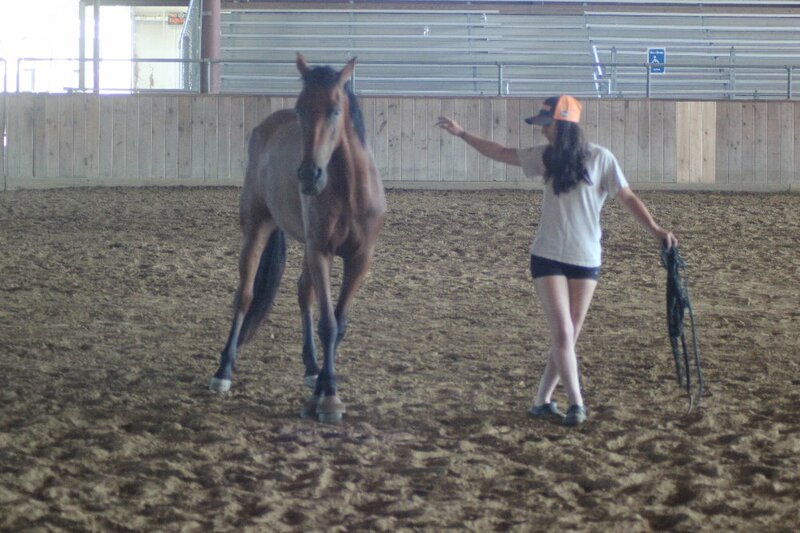 Dixie and I have been busy doing demos and getting ready for the competition which is only a week away! The demo went awesome at DeCarli Farm! Huge thank you to Daryl DeCarli, everyone who donated something for the silent auction, and all who attended to show their support! We were able to raise enough money for Dixie to have her surgery! Dixie came up muscle sore about a week and a half ago. 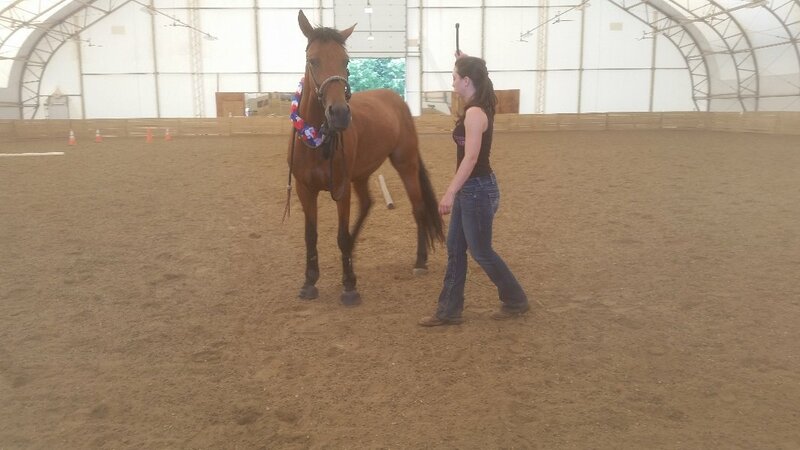 Unfortunately between the tumor and the muscle soreness we have lost a considerable amount of under saddle time. Dixie's myofascial release therapist Cathleen Peabody and I were talking the other day about just how much the trauma to her mouth has really affected her whole body. She has lots of second hand issues developing due mostly to compensation. Due to the unfortunate and unforeseen events Dixie and I will be attending the competition for fun. We will still be participating in the classes just at Dixie's speed. We are excited to meet new people and hopefully some of the amazing people who have been supporting us through this crazy journey! As I mentioned above we have raised enough money for Dixie's surgery! My new goal is to keep this momentum going and turn it into The Dixie Fund. The Dixie Fund's goal will be to help trainers who get put in a situation such as the one Dixie and I found ourselves in. When you compete in a competition that requires you to care for a government owned animal which has never been touched before; it makes for an interesting journey. 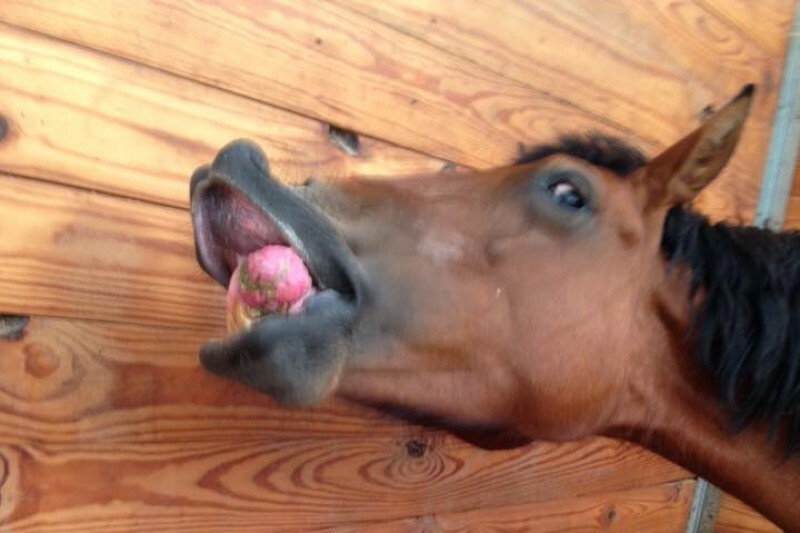 Not only do you go into it unaware of the horses disposition but also its physical condition. 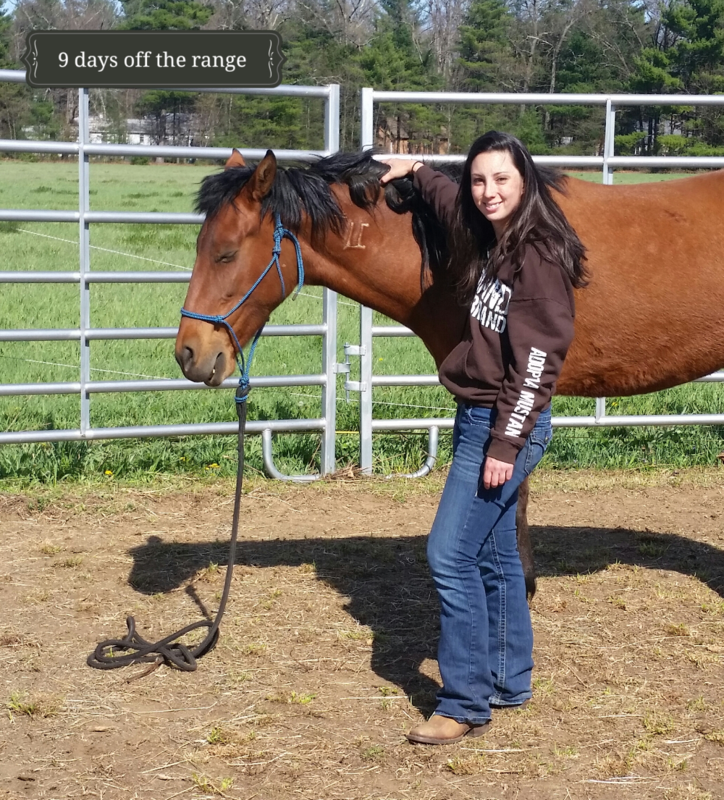 Mustangs that need help or a little extra attention on the veterinarian side of things aren't terribly uncommon. 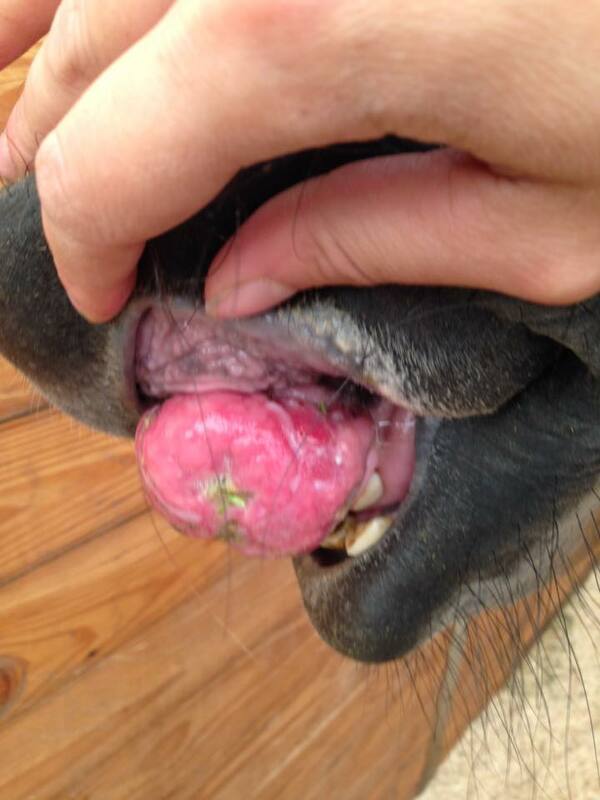 Most of them don't have gigantic tumors in their mouth but may come with an old leg injury or underlying lameness issue. It is very important to me that the Extreme Mustang Makeover live a long meaningful life. In order for that to happen the trainers need to keep coming back. It makes it a much easier process if you can take comfort in knowing that god forbid you draw an animal with costly issues that there is at least a little help. This experience was seemingly turning into a nightmare but with everyone's help we were able to salvage it! For that I can't thank you all enough so I will be working hard to pay it forward. Once I discuss this possibility with the MHF I will update you all hopefully with news of The Dixie Fund's official formation. Look for our demo schedule! The biopsy results came in today! Dixie has a rare type of tumor called a plasma cell granuloma or inflammatory psuedotumor. This is more then likely good news although it is hard to be 100% simply due to the lack of information out there about this type of tumor in horses. We are waiting on a quote for the procedure at which point we will decide when we can move forward with step 2. Step 2 will be removing the mass and more then likely a tooth or two. Afterwards Dixie will need to be on antibiotics and will also need diligent care to ensure proper healing. It is more difficult then I thought to keep my emotions out of this. I'm glad that it's not cancerous but am nervous about the surgery. Anxiously awaiting the quote so we can figure out when we can get it taken care of. DeCarli Farm will be holding a fundraiser July 23rd. I will post tomorrow with the details. Huge thank you to everyone whose supported us through this tough time. We have raised 2,330$ in a short amount of time. Please share and help us reach our goal! Good luck. I hope you meet your goal.